People who desire a non-surgical hair regrowth strategy that is safe and effective choose the PRP Hair Regrowth Procedure. This innovative procedure combines Platelet Rich Plasma (PRP) injected into the scalp to encourage hair growth. PRP is loaded with growth factors that promote angiogenesis and localized cell regrowth. Used to treat both male and female pattern hair loss, PRP Hair Regrowth has also worked for people who have Alopecia Areata, eyebrow Hypotrichosis and other causes of hair loss. First, a simple blood draw is performed and specially processed to produce the PRP. A local anesthetic is then administered to completely numb the scalp treatment area. The PRP is then administered via a series of injections over the full scalp or in a localized treatment area such as the eyebrows or beard. The recovery from the procedure is typically uneventful. Some mild swelling of the forehead is occasionally seen and avoiding vigorous activity is recommended until any swelling is gone. Patients can wash their hair normally immediately after the injections. Is PRP Hair Regrowth Right For You? Millions of people - both men and women - struggle with hair loss. The reasons for hair loss vary and can include disease, genetics, stress and hormonal imbalance. Whatever the cause, everyone wants a solution to hair loss. 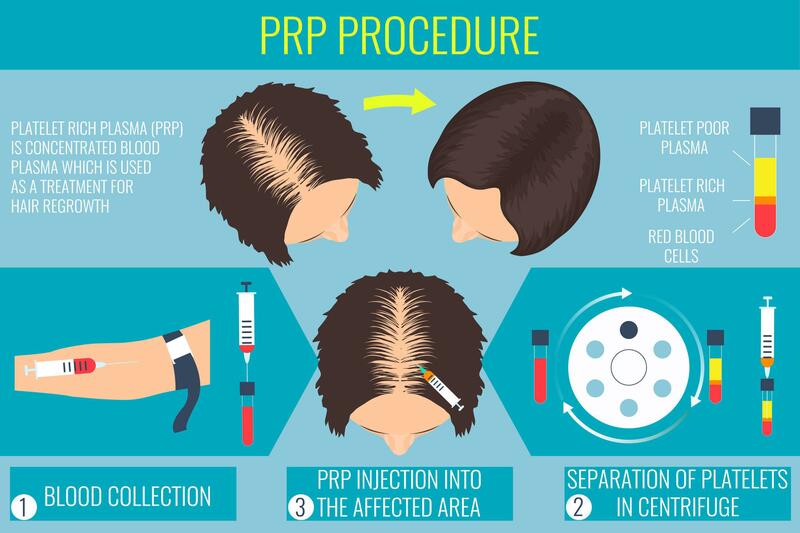 PRP Hair Restoration is a non-surgical/non-pharmacological option to help alleviate this problem. What Types of Conditions Respond to PRP Hair Regrowth?  Male pattern hair loss, especially in the early stages of balding, or anytime there is a lot of miniaturized hair on the scalp.  Female pattern hair loss at all stages of hair loss.  Hypotrichosis (fine/reduced hairs) of the eyebrows or beard.  Alopecia Areata and Alopecia Totalis.  Metabolic causes of hair loss - including iron deficiency and medication-induced hair loss.  Treatment in areas with dead hair follicles (shiny bald areas) not recommended. If you are looking for healthier hair, contact our office for a free consultation to see if PRP Hair Regrowth is right for you.